SUPERSTRENGTH FASTCRETE 30 MPA is a user friendly formulation of sand aggregrate, cement and admixtures. This unique formulation improves the overall performance of the product. It is prepared in a fully computerized environment, where a high degree of accuracy and consistency is maintained. It has to be poured directly into a hole which is already filled with the required amount of water and the post. No mixing is required. The initial set time is only 15 minutes. Designed for fencing, where a higher strength is required for posts. Perfect for all kinds of building and construction projects such as heavy duty fencing, sun rail posts, retaining walls and structural applications and foundations which require strengths of up to 30MPa. A minimum of two bags is suggested per standard post which stands between 1.2m – 1.8m high. 0.0096m³ per 20Kg bag. Dig a hole and place your post in it. Keep post off the ground to prevent rot. Completely wet the hole and compensate for any ground drainage that might soak up the water required for SUPERSTRENGTH FASTCRETE CONCRETE. In sandy soils line the hole with plastic. Pour 2.5 – 3.5 litres of water, per bag of SUPERSTRENGTH FASTCRETE CONCRETE. slowly pour the dry contents of the SUPERSTRENGTH FASTCRETE CONCRETE bag around the post. Ensure the concrete gets wet progressively as you pour. Do not empty the bag quickly as this will lead to dry patches and you will have to rod to allow for water penetration. If any drying on the top still presists, you can sprinkle water. After a minimum of 15 minutes the hole can be topped up with earth and after 1 hour the post can wire straining or similar pressure. The average Kiwi fence stands between 1.2m – 1.8m high supported by 100×100 H4 Posts. 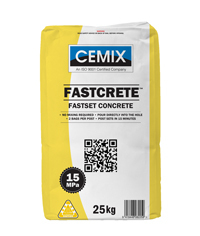 Cemix recommends 2 x 20kg bags per post. It is recommended that a third of the post should be sub ground and covered with concrete. The diameter of the hole in the ground needs to be a minimum of twice the diameter of the post. 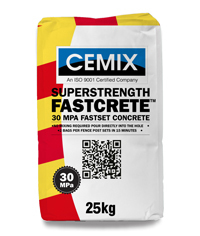 CEMIX SUPER STRENGTH FASTCRETE CONCRETE consists of a properly proportioned mixture of stone, gravel, sand, Portland cement and other admixtures approved for use in concrete that will harden in 15 minutes to achieve 30Mpa target strength in 28 days. Strength (MPa) – 20MPa @ 7 days, 30MPa @ 28 days. Packaging – 20 & 25kg bags. CEMIX SUPER STRENGTH FASTCRETE CONCRETE in a cool dry area and use within 6 months.